Death Vanish are a solo project from Connecticut that plays a very primitive form of black metal and this is a review of his 2018 ep "Cold Hammer Of melancholy" which will be released in November on cassette by Eternal Death. Most of the music sticks to either a slow or mid tempo direction along with a small amount of dark sounding melodies while the music only adds in a small amount of guitar leads along with the bass guitars also being used as a lead instrument and the songs always stick to a very heavy and raw musical direction. Death Vanish plays a style of black metal that is very primitive and heavily rooted in the 90's, the production sounds very dark and raw while the lyrics cover dark, melancholic, philosophical and anti religion themes. 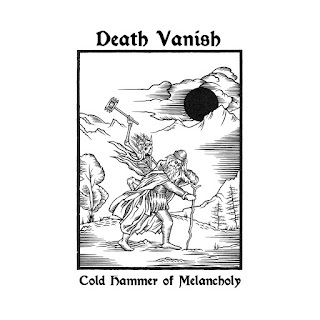 In my opinion Death Vanish are a very great sounding primitive black metal solo project and if you are a fan of this musical genre, you should check this ep. RECOMMENDED TRACKS INCLUDE "Cold Hammer Of Melancholy" and "Bloodless Fog (Of My Mind)". 8 out of 10.